There is an old saying that one should “pick one thing and do it well.” Although the author of that adage is unknown, many successful people and organizations have followed that advice. One of the best examples of how this advice truly works is KNIPEX Tools. KNIPEX Tools makes one thing – pliers — they do it so well that more than half the countries in the world use their pliers. Pliers are an ancient tool. Historians place their origin back 3,000 years B.C. They are a basic hand tool necessary to hold objects firmly and were possibly developed from tongs that were used in Europe to handle hot metal back in the Bronze Age. As is true of all manual tools, pliers are made to increase the effectiveness of the human hand. Pliers are designed according to the principle of the two-armed lever which makes it possible to convert lower force (e.g. manual force on the shanks of the pliers) into a greater force which in the case of pliers is effective in the gripping jaws or in the cutting edge. The “Alligator” which is a newer style of water pump pliers with self-locking jaws for pipes and nuts which makes it no longer necessary to press the handles together when using them. These pliers were introduced in 1973. The “Cobra” which is also a water pump plier came to market in 1984 and can be adjusted quickly and in fine increments at the touch of a button. The “Cobolt” compact bolt cutter, introduced in 1988, is cleverly designed with a lever-action mechanism that increases the user’s manual force by up to 20 times. The “Pliers Wrench” was developed in 1994 and is a fully new style of tool with parallel gripping smooth jaws for gently holding soft surfaces. Currently, KNIPEX Tools offers a range of approximately 1,000 different types of pliers for existing applications as well as emerging industries in solar technology, wind energy, and aviation. “At KNIPEX, we believe that less is more,” said Alan Sipe, President and GM, North America for Knipex Tools. “We concentrate on one single product group and in this way we achieve appreciable benefits in quality and performance. That’s why KNIPEX is the world’s leading brand in pliers today,” he explained. That laser-sharp focus has sustained the company for 132 years. KNIPEX Tools was started in 1882 by Carl Gustav Putsch, a journeyman, who along with two apprentices started up a small forge to craft pliers in Cronenberg, Germany. Together they forged carpenters’ and farriers’ pincers by hand in the cellar of the Putsch home. At the turn of the Century, Putsch acquired a steam-powered drop hammer and added that function to his thriving business. Legend has it that his entire house shook when the hammer was in operation. And, that there was so much shaking, he decided to build a separate forge on a neighboring site to preserve the safety of the crockery in his home and assure domestic harmony. By 1927, the company had 27 employees and produced about 7,000 pliers every week. In 1954, Carl Gustav Putsch’s grandson, Karl Putsch, took over the management of the company. He expanded the product range and modernized the production processes. He and his wife Ilse, who had been working at the company since 1951, developed KNIPEX Tools into the European market leader. By the 1990s, the company was ready to expand worldwide. Under the new leadership of Ralf Putsch, who joined the company in 1987, KNIPEX Tools significantly increased its exports and sales branches were opened in the United States, Russia, and China. 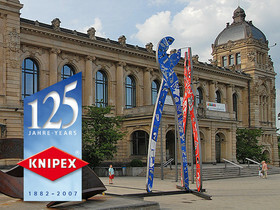 At the time of its 125th anniversary in 2007, KNIPEX Tools had succeeded in doubling its sales in just 10 years with 800 employees producing 45,000 pliers a day. In 2012, KNIPEX had its most successful year in the company’s history; it employs more than 1,300 people around the world, and has opened a new branch in Dubai. Focusing on one product is key to KNIPEX Tools’ success. But so is family. The company has been an owner-managed family enterprise since its inception and, now in 2014, is in its fourth generation of family management. This sense of family is extended to the KNIPEX Tools’ employees as well. “We feel a special bond with our employees and the people in their region,” said Sipe. “We produce exclusively in Germany with the entire value-added work done by our employees in our Wuppertal factory. From forging the plier blanks to the packaging. We also secure our technical advantage by developing and building a lot of our machines and plants ourselves. This can be done because of the exceptional qualifications and training of our employees,” Sipe continued. Also in 2014, KNIPEX received the first “Outstanding Employer” seal of approval from TUV Rheinland. The TUV auditors spent two days auditing the company and its human resources management before awarding the seal. And, KNIPEX was named an “outstanding training company” in 2014 by the ertragswerkstatt organization which shows a high level of commitment to vocational training as well as a high satisfaction level by the trainees themselves. “Above all, we are committed to social, educational and cultural issues,” said Sipe. Even with all its awards and accolades, KNIPEX Tools remains loyal to its core line of business – designing and manufacturing great pliers. The company’s goal is to make daily work with pliers easier, quicker, and safer for the people using them. That’s why they use particularly high-quality materials and modern production technology. KNIPEX constantly works to ensure improved performance, service life, and ergonomics of their tools to meet the expectations of professional users. KNIPEX Tools – doing one thing and doing it well with pliers. Newsletter: Volume 17 – Issue 9 →← Readers’ Choice Awards: 15 Years Running!